We wanted each of our 79 rooms to have a relaxing and enjoyable ambience. Hence, we have laid great value on generosity, natural materials, discrete colours and optimum room climate. 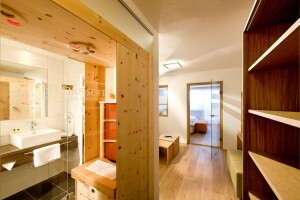 The restful rooms have a marvelous view of the surrounding Ötz Valley Mountains and almost everyone is equipped with an isola.bella hydrosoft sauna with which wellness becomes personal and possible at any time.